وجه العملة شعارجمهوري تشاد وعبارة " الجمهورية التشادية 2 troy أوقية 999 فضة نقية 1000فرنك CFA"
شعارجمهوري تشاد وعبارة " الجمهورية التشادية 2 troy أوقية 999 فضة نقية 1000فرنك CFA"
2oz 2016 Egyptian Relic Series | Horus Silver Coin Purchase your 2 oz 2016 Egyptian Relics Series I Horus Silver Coin from our online store for the best price online. This 2 troy ounce .999 silver coin was created by Scottsdale Mint in conjunction with The Chad Republic. The 2016 Horus Silver Coin is the second release under the Egyptian Relic Series and follows the King Tut silver round, released in the same year. The reverse depicts an ancient Egyptian relief of Horus, the Egyptian sky God. 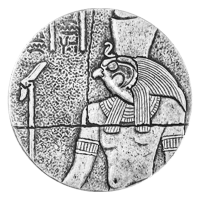 He was most often depicted as a falcon or a man with a falcon head. The obverse features the coat of arms of the Republic Of Chad, the Chad legend, as well as weight, denominational value of 1000 Francs and the purity. The rimless coin design is startling and unique and the edges of the coin feature decorative chisel-like markings to add to the “relic” effect. Diversify your holdings with the coins from the breathtaking Republic Of Chad Egyptian Relic Series. Be sure to order your 2 oz 2016 Egyptian Relics Series I Horus Coin today.